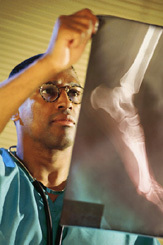 Arthroscopic surgery on the foot and ankle may be used as a diagnostic or treatment procedure, or both. A small instrument, called an arthroscope, penetrates the skin through small incisions.Tiny cameras can be inserted through the arthroscope, allowing the surgeon to accurately see the area and/or damage. Other small instruments can also be inserted through the arthroscope to make surgical corrections. Because arthroscopy is less-invasive and traumatic than traditional surgery, it reduces the risk of infection and swelling, and allows for significantly speedier healing and recovery. Most arthroscopic surgeries of the foot and ankle are performed on a same-day, outpatient basis using a local anesthetic.